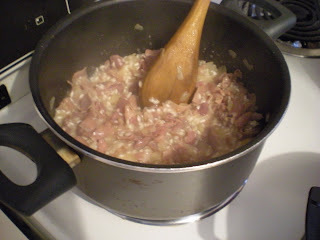 Risotto is the first dish that my Brazilian friend knows how to cook when she came to Montreal. This is excellent because I love risotto, but never had a chance to make one yet. This dish is straightforward. If she knows how to do it, you can do it also. Weirdly, she puts blue cheese in it. I'm not a big fan of strong cheese, but this makes the risotto very delicious. You can always substitute blue cheese for parmesan for a softer taste. 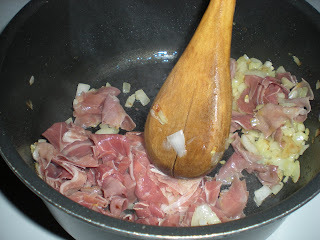 Also, prosciutto can be cooked at the beginning with the onions for crispness or for uncooked prosciutto, add at the end along with the blue cheese. 1. In a medium saucepan, heat the stock to a simmer. 2. Meanwhile, in a large pot, heat oil over medium heat. Cook onions (and prosciutto) until golden, about 5 mins. Add rice and stir for 2 mins. 3. Gradually add a ladleful of simmering stock and stir constantly until it is absorbed before adding more. 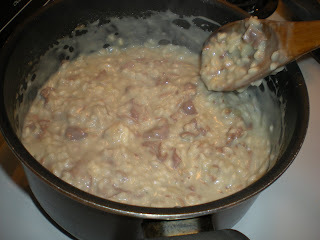 Continue in this manner, until the rice is tender and has a creamy consistency but still retains a bite. It takes about 25 mins. If stock has run out, add water. 4. Turn off and remove from the heat. Stir in the cheese (and prosciutto) and serve immediately. Oh delish! Blue cheese? You're talking good stuff!